Energy/shade screen systems are one of the most common conservation measures funded by federal and state grant programs. With a payback of two to four years, these systems provide a good return on the money invested. They are most common in gutter-connected greenhouses but can be installed in free-standing and hoophouses. Energy/shade screen systems can provide 30 to 50% savings in heating costs. Often referred to as energy blankets, they save energy by reducing the heat loss surface area, providing an extra insulation barrier and trapping a layer of dead air on both sides of the screen material. If the material contains some aluminum, the infrared part of the heat within the greenhouse will be reflected back toward the plants reducing heat loss another few percent. The aluminum strips can also save energy in the summer by reflecting the incoming heat back out of the greenhouse reducing fan operation. An energy/shade screen is a mechanical system consisting of a drive motor, support cables, energy/shade material and controls. A gear motor is needed to power the drive system. One motor can handle up to an acre of screen. Gutter to gutter or side to side systems require less material but form a larger bundle in the storage position. They are easier to install as work is done at a lower height. With this system, equipment and plants cannot be supported from the lower truss cord. Truss to truss systems are more common. They can be configured flat at the lower cord of the truss or formed into a slope-slope or slope-flat-slope shape to follow the roof of the greenhouse. The latter two may allow heating, lighting and watering equipment to remain in place without having to move it. Flat systems reduce the volume of greenhouse that has to be heated. Two types of drive systems are used; the cable drive and a rack and pinion drive. Both are powered by gear motors. In the cable system a drive shaft across the greenhouse moves cables that are attached to the leading edge of the screen. This pulls or pushes the screen back and forth. In the rack and pinion system a tube supported on rollers and attached to a rack meshes with a pinion on the motor to moves the screen. Some growers in northern climates are installing a two screen system. The lower screen has a high energy rating and the upper one is mainly for shade but provides additional 10 to 15% energy savings when extended at night. Another variation is to install a clear screen material as the energy saver and keep it extended on cloudy days when there is very little sunlight. The most common materials for energy screens are composite fabrics of alternating strips of clear and aluminized polyester or acrylic held together by a finely woven mesh of threads. Other materials include knitted and woven bonded polyester, metalized high density polyethylene and polypropylene. Look for the warranty life (usually 5 to 10 years), strength and flexibility. Many screen materials are designed to provide summer shading. For comparison, manufacturers list both the shade factor and the energy savings. Shade levels from 5 to 90% are available with the most common being 40 to 60%. Screens can also have an open weave or closed weave. 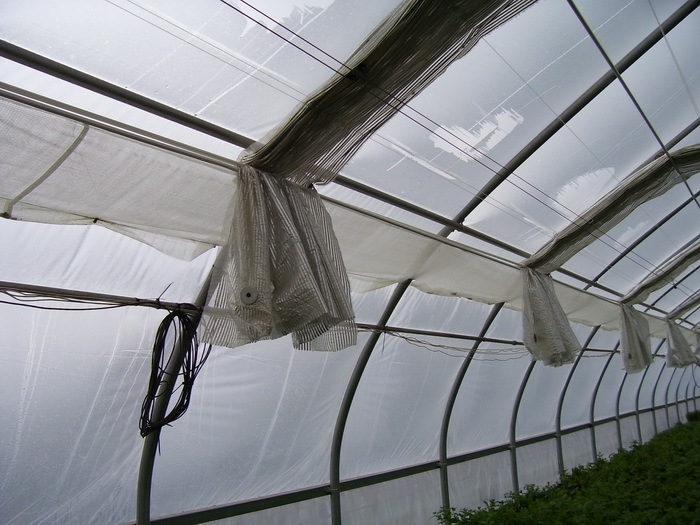 The closed weave has a higher energy savings and is used in greenhouses with fan ventilation systems. For natural ventilation, an open weave allows the heat to rise through the screen when it is extended. Some growers install a closed weave to get the high energy savings and then crack the screen open to allow the summer heat to escape up through the vents. Most screen materials are plastic. In a fire these can support combustion and increase the intensity of the fire. Materials selected should either have a fire break installed or be fire-retardant. The fire break is a section of fire-retardant material on both edges of a screen panel. It reduces the flame travel. 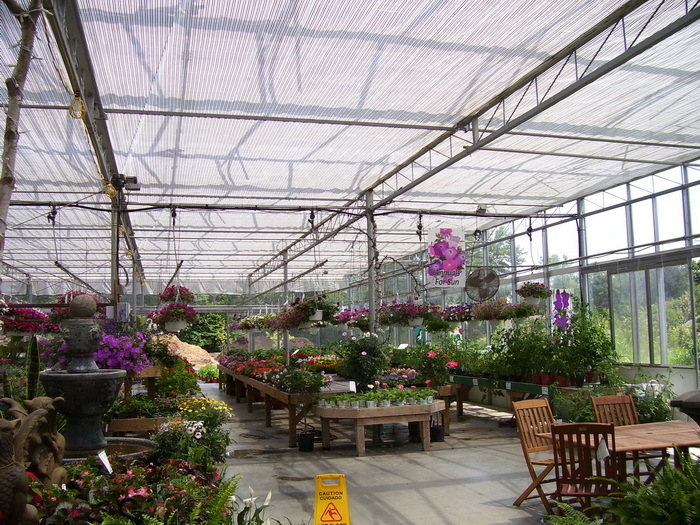 Some building inspectors require the screen be fire-retardant material when used in garden centers and greenhouses open to the public. Along with this the support cables should be stainless steel instead of the more common monofilament. For production, a good choice of screen material is the L.S. Svensson, Inc. Tempa 5557 D FB It is made of 4 mm wide aluminum and polyester strips held together with a polyester filament yarn. The aluminum reflects the heat back into the greenhouse at night during the winter and reflects the sun’s heat out of the greenhouse during the summer days. The yarn allows moisture to go through, reducing condensation and dripping. The 40 cm wide firebreak material around the individual panels is intended to limit the screen to screen fire spread should one occur. A seal is installed along the sidewalls to prevent heat from escaping to the overhead area. In a typical installation the growing area could be kept at 65°F, the area above the screen would be around 35°F on a night when the outside temperature is near 0°F. The Tempa 5557 material has a 45% direct light transmission, 43% diffuse light transmission and 57% energy savings and is used for closed roof greenhouses. For house plants and other shade loving plants a material with more shade should be used. A Tempa 6562 D may be a better choice as it has 65% shade and 62% energy savings. The typical cost of a screen system is $1.50 to $4/sq ft depending on the size of the installation, screen material used, number of obstructions that have to be worked around and ease of maneuvering man-lifts in the greenhouse. Additional cost may result from having to move heating, cooling, lighting or irrigation equipment out of the screen area. Energy screens can be installed in hoophouses. A hoophouse with a truss every 8’ is desirable as the screen can be installed to move in 8’ panels. They can also be installed in free-standing A-frame houses of either metal or wood design. The cost is generally higher as there is usually more cutting and fitting of the material. Deciding when to open and close the screen can be done several ways. The simplest is manual control, basically a switch that turns the gear drive motor on. The disadvantage is that someone has to be around to make the decision on when to activate it. As with other control devices such as heaters or vents, this decision may not always be made at the best time. These decisions can also be made by controls that are based on time of day, light level, greenhouse temperature, humidity level or all of these. Controllers have been developed that integrate some or all of these functions. A clock is incorporated to open and close an energy screen base on sunrise and sunset. It is adjusted weekly to account for the lengthening or shortening of the daylength. 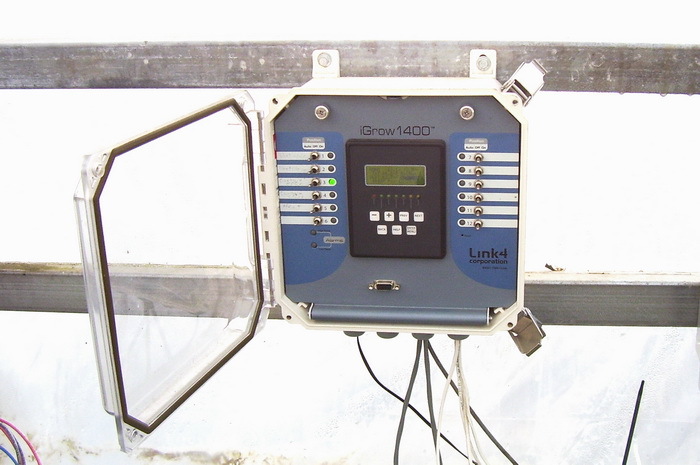 A photo sensor is included to activate the system when the light level inside the greenhouse reaches a preset level either too low during the winter or too high during the summer. Temperature and humidity sensors may be included to provide control when preset levels are reached. A weather station is needed to provide outdoor light level, temperature, humidity, wind and rain or snow conditions. Gap positions – this sets the percent open or close position under different conditions such as early on a winter morning to reduce thermal shock or during the summer to provide better shading. The gap steps and speed of movement can be controlled in some systems. Snow detection – this can open the screen and turn on the heat when it starts to snow. The standard system uses nylon monofilament or stainless steel cables to support the screen material. The screen material can either rest on top of the network of cables or be suspended by hooks from the cables. A gearmotor powers a drum or rack and pinion that moves the leading edge of the screen material. Control is either with a manual switch or electronic controller. In smaller greenhouses, a manual system opened and closed by hand could be installed. These work easiest when the screen material is supported by a track system. A screen system is easiest to install if the greenhouse is empty of plants. Man-lifts are frequently used to elevate workers to the truss level and require space to maneuver. Heat supply pipes that are above the screen have to be insulated or moved lower. Vent arms, water pipes, light fixtures and electrical wiring may also be in the way. The screen system requires a clear vertical area of at least 12”. Closed weave energy screens need to be installed to provide a tight seal all the way around the edges. The most common method is to install a narrow ledge along the sidewall made from polycarbonate sheets or fire resistant screen material. The side edges of the screen slide along the top of this ledge. The back edge is attached to the truss and the leading edge is attached to rigid tubing that seals the screen against the truss. 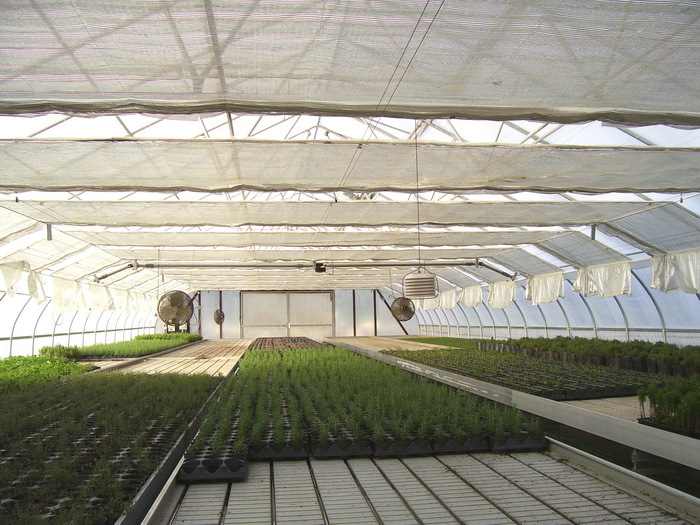 Typical temperatures that would be observed in a heated greenhouse on a cold night might be 60ºF under the screen and 35 - 40ºF above. I have been in greenhouses where it was warmer above the screen than below showing that heat was escaping through holes, or gaps around the edges. Regular maintenance is needed to keep proper tension in the cable system. Pulleys and gear motors should be lubricated once or twice a year. Screen materials tend to wear at the rub points or where they are supported by hooks. Repairs may have to be made at these points. (2016) The USDA grant programs have been paying toward of the cost of the total installation in existing greenhouses. Some state programs provide additional money toward this practice. Low interest loans are available for some of the remaining cost. A good website to visit is www.desireusa.org that lists information and contacts for most of the energy conservation assistance programs in the United States. Take advantage of grant funding to improve your greenhouse and reduce energy consumption. The payback is usually very short.